The Hannen Room was full to capacity when Michael Pooley gave a fascinating illustrated talk about Shiplake Lock Island, in which he shared his great love of the summer camp held there. Michael's association with the island had begun in 1943, when his father had bought a plot there. 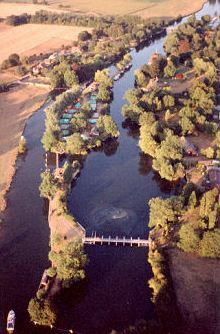 The River Thames, having passed Sonning and St Patrick's Stream, curves below the cliffs where now Shiplake Church stands, passes Phillimore's Island and then splits to either pass over the weir or pass through the lock cut, and this is where the island is located. Michael outlined the history of the island. The mill was mentioned in the Domesday survey, and a lock built near the paper mill in 1773, by widening the mill race. A turn bridge for allowing cattle to pass was added in 1787, and a lock house in 1807. After the passing of the Thames Navigation Act in 1866, ownership passed from Capt Phillimore to the Thames Conservancy. The mill was pulled down in 1907, and the paddle weir rebuilt 7 years later, and a bathing house added in 1932. The lock keeper's house on the main island was rebuilt in 1932. The island camp site consists of 18 plots. It was originally privately owned until 1891, and camping was already a regular activity there by that time, using ridge tents, and lit by oil lamps - as some still are. The land was offered for auction in 1891, for 'potential hotel development', but a benefactor named Crawford paid £836/12/8d for the land, ensured it had a restrictive cove-nant to preserve the camping rights, and then sold it at cost to the City of London. Due to the distance involved, the City found some difficulty in administering the island, and so in 1914 granted a £1 per year perpetual lease for 2000 years, with the restric-tive covenant in place, to the Thames Conservancy. The camps were then been run by the lock keepers, who hired out skiffs and punts to islanders. In the early 1900s the conservancy allowed huts to built near the tents - as it was thought safer for cooking - but they were not to be used for sleeping. 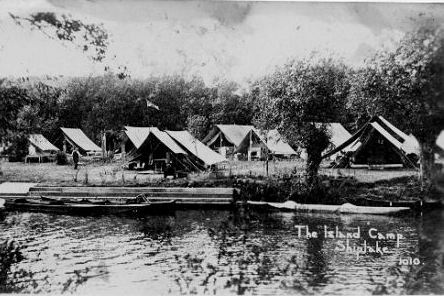 At that time, ladies were not allowed to sleep on the island, but had to retire to wooden huts on the Shiplake side. 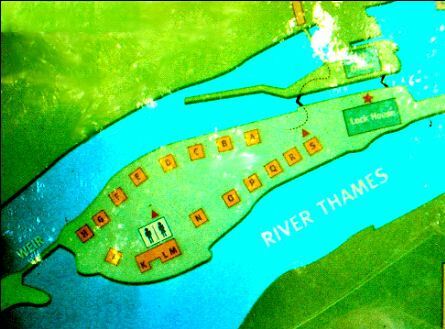 The Thames Conservancy refused - as have the National Rivers Authority and Environment Agency since - to give more than a 1 year at a time lease to the plotholders. Despite that, the community has remained remarkably static - usually plots pass-ing from father to son. The families come from a wide area - the West Country, Liverpool, Leeds etc. Since 1945, there have been 4 marriages between island families. The river was quiet, apart from barge traffic, in the early post-war period, but gradually Salters steamers became oil fired, leisure boating increased with the advent of fibre glass boats, and narrow boats appeared. The Environment Agency confirm the right to use the plots in the spring each year. Each plot has a wooden hut on sleepers, to try and keep it above flood level, and boards on which the tent is put. It is always a concern as the plot is opened as to what will have happened over the winter months. 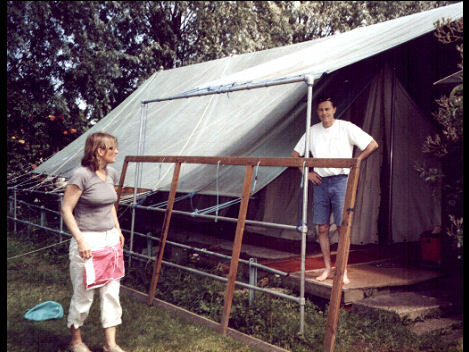 The canvas is laid out on the boards, the poles inserted, and - with the help of other campers - the tent erected. Once secured, the carpets, bedding and chest of drawers can be put in place! It is a great family event - everyone having ideas on 'how it was done last year'. By Whitsun, the camp is in full swing, and barbecuing starts. Once the lock closes, there is peace and tranquility on the river in the evenings, the sound of Shiplake bells drifting on the air. Amongst the island families there is a special camaraderie. Henley Regatta is an important event in their calendar - if the weather is favourable they go down river to watch the rowing opposite the Stewards Enclosure. Then comes Swan Upping, trips round the Patrick Stream. All of these events - or anything else in between - can prompt a party. Then the Wargrave and Shiplake Regatta takes place - in which many campers take part. The island is filled with youthful exuberance, and the camp is full to bursting for 2 days of exceptional racing - and of course a party before the fireworks. The event is the highlight of the year for many people. In 2007 there was no regatta, so the islanders invented one - with tug of war, a welly boot race and a version of a dongola race (with a blindfold crew) on land !